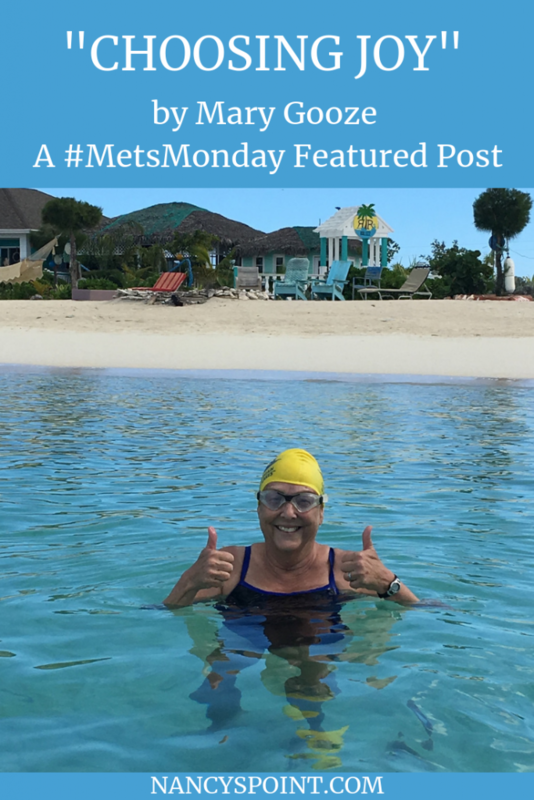 I’m pleased to share the next #MetsMonday featured post. This one comes to you from Mary Gooze, the woman behind the blog titled, “7777+ Days”. Mary was diagnosed with breast cancer in 2012. She learned it had metastasized to her bones in 2014. Mary does amazing things through her unique advocacy work. (I’m in awe. You likely will be too after you learn about it.) She shares about her advocacy and how choosing joy helps her get through dark times. Thank you for sharing your voice on Nancy’s Point, Mary. Be sure to leave Mary a comment or ask her a question below. You have metastatic breast cancer. Those words were frightening enough four years ago, but I had no idea how much I would have to adjust my emotional as well as physical being to living with this diagnosis. Questions filled my thoughts about what would change in this charmed life I had been living. Will cancer take away everything leaving me stranded with a worn out body and a depleted soul? After reading the dire statistics of this disease, I felt I had to do something instead of waiting for my demise. According to the literature, the median survival rate is three years. This knowledge propelled me into action to quickly save myself. 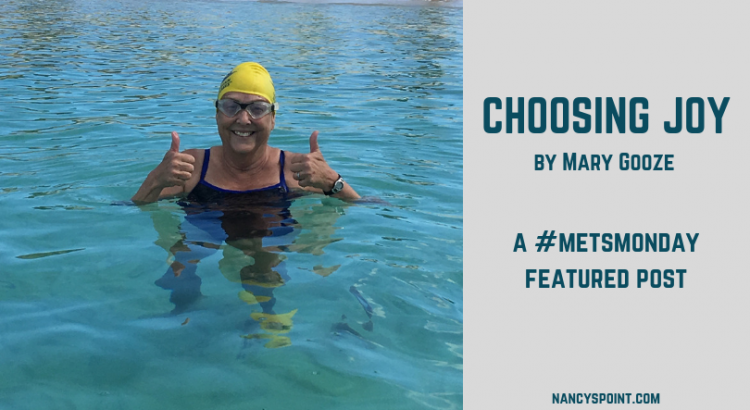 Since I had been a long-time swimmer, I decided to swim across lakes with the goal to educate people about the disease and lack of funding supporting stage IV breast cancer and also, to garner precious donations. My ultimate goal, of course, is to give others like me more time on this earth. I kept preaching research is our best hope, and it paid off as I am approaching the million dollar goal I had set for myself four years ago. The added bonus of swimming is that it has helped me both physically and mentally endure the side effects from the treatments. However, it was a bit naive on my part to think all I had to do was raise money for the researchers and a cure would be found. Cancer is a complicated disease and brilliant scientists have been working on it for years. They are getting closer; however, the reality has been a readjustment of my survival expectancy and focusing my advocacy to making metastatic breast cancer a chronic disease for my daughter’s and granddaughter’s generation. So where does this leave me as I face living every day with cancer knowing that, despite my efforts, I might be running out of time? During the first year of my One Woman Many Lakes campaign, I was focusing on something other than the outcome of this disease; however, over time, I found it increasingly difficult to keep it from interfering with my daily thoughts. A mighty but short three-letter word helped me in my darkest hours after learning of progression or when dealing with side effects from treatments that left me exhausted and drained. When I felt myself going down the rocky road of despair, I would think of all the joy in my life, and found I didn’t have to look far. That golden nugget of a word could reference something as tiny as a hummingbird alighting on a flower or as joyful as the grand bear hugs from my beloved granddaughter. Joy has kept me focused on living and not dying. When the gloomy thoughts start percolating, I remind myself to stop and look around. I have discovered that little word can push me out of the dumps and into a more uplifted mindset. When there is joy, I smile. And who can’t help but smile back? Friends and family respond to my (usually) chosen brighter outlook, and even though there has been no scientific evidence that my attitude will prolong my life, it encourages others to want to interact with me, and for me, that connection is priceless. Too simple? Maybe. Maybe not. Sometimes I reflect upon what cancer has taken and what it has left me with as well—thinning hair, wrinkled skin, fatigue filled days and a sooner than later expiration date. But one thing I know to be true; cancer has not robbed me of JOY. I intend to never let it. 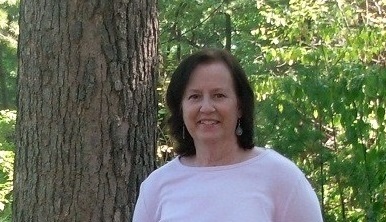 Bio: Mary Gooze is a wife, mother of three, grandmother to a beautiful granddaughter and a retired teacher. Since her metastatic breast cancer diagnosis in 2014, her passion has been to bring awareness and funding specific to mbc. She blogs at 7777+ Days and runs the One Woman Many Lakes initiative where your donations are welcome. And she swims. A lot. Do you have a comment or question for Mary? Are you a swimmer? If so, have you ever swam across a lake? Cancer or no cancer, how do you choose joy when it’s a challenge to do so? 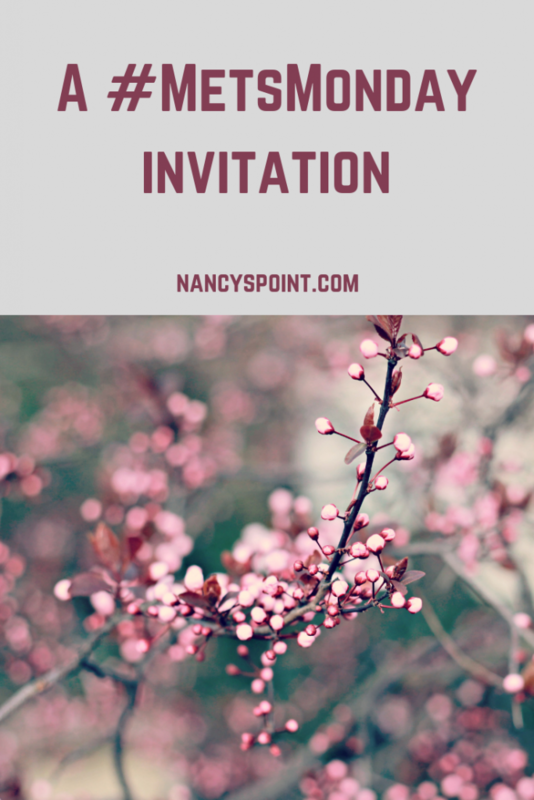 Sign up for weekly updates from Nancy’s Point. Keeping it real. Support you can use. This is beautiful! Thank you for sharing your choice to choose joy and continue to raise tremendous awareness and funds for metastatic breast cancer research. Thanks, Janie. You have always been one of my super supporters. Thanks so much for this article, so inspiring! I am swimmer and can’t wait to get back to it after treatment. Good luck to you. Swimming has been a tremendous outlet for me. Thank you for an inspiring article! Good luck for many lakes to come!!! Go girl!! Thanks. I’m going to keep swimming as long as I can. Mary, you know how your words have inspired and comforted me and how I’ve so appreciated how quickly you always respond to my many questions. You inspired me to swim across Bear Paw Lake in Havre Mt the summer before last. (I would still love to swim that one with you. No motor boats allowed.) I think of you often and how your joy shines from within you and spreads to all who have contact with you. Keep up the good work! Good to hear from you. Thanks for writing. Let’s plan on that swim together. Wow! I’m a swimmer, but you put me to shame. Was it difficult to raise that kind of money for research? I’m always amazed when I read about endeavors such as this. Would love to read a blog post on how you did it. Thanks for your kind words. Please visit my website on where I’ve been swimming and how we raised the funds. Mary, As always, I admire you and consider myself fortunate to call you my friend. Thank you for all of your efforts in raising funds and awareness for MBC and for More For Stage IV. You are right there behind me. Thanks for listening to me when I rant! Here’s to more swims for us!